New stories are set to be written at the 2015 Inglis Classic Yearling Sale, which has been widely embraced by vendors leading to a superior catalogue and extra day added to the Summer Book on 8, 9 and 10 February next year in Sydney. “We were simply inundated with over 1,400 entries for the Classic Summer Book and after a rigorous selection process, physically inspecting every yearling we are thrilled to catalogue 574 quality lots,” said Jonathan D’Arcy, Inglis National Bloodstock Director. 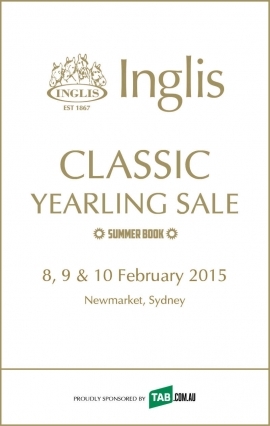 CLICK HERE to view the 574 lots Inglis Classic Summer Book or download it now via the Inglis Sales iPad App. As Australia’s most accessible sale Inglis Classic has earned a formidable reputation as the source of the tough, precocious sprinter milers that Australian breeders are world renown for. Many great racetrack success stories have their origins at Inglis Classic, such as 2014 juvenile Group winners Peggy Jean, Believe Yourself and Brazen Beau. Offered by Murrulla Stud as Lot 3, Brazen Beau was the first of 23 yearlings from the first crop of Inglis Classic graduate I Am Invincible to be offered at the 2013 Summer Book. The attractive colt was purchased by OnTrack Thoroughbreds for $70,000, which is just 10% of the colt’s racetrack earnings this year and a much smaller fraction of his stud value as a Group 2 winning two-year-old and recent victor of the stallion-making Group 1 VRC Coolmore Stud Stakes at Flemington under the guise of champion trainer Chris Waller. Believe Yourself was the most expensive filly at the 2013 Inglis Classic when snapped up by owner Tomohiro Sekiguchi for $140,000 from Turangga Farm’s draft. The daughter of Golden Slipper winner Sebring had ‘top juvenile’ written all over her and under Gerald Ryan she duly delivered earlier this year, winning the Group 2 ATC Sweet Embrace Stakes on her way into the Golden Slipper where she finished an outstanding fourth behind Mossfun. Peggy Jean’s story for Triple Crown Syndication also began at Inglis Classic where the filly was purchased from Torryburn Stud for $45,000. Trained by Gerald Ryan the Myboycharlie filly won the $250,000 RL Inglis Classic in January before her way to Group 1 glory in the ATC Inglis Sires’ Produce Stakes during The Championships. With $900,000 in earnings the story of Peggy Jean is full of highlights already for her syndicator, owners and trainer. Buyers can begin another 574 stories with the yearlings selected for the 2015 Inglis Classic Yearling Sale Summer Book in February. Brazen Beau’s sire I Am Invincible is represented with 25 yearlings in catalogue. There are six yearlings by Believe Yourself’s sire Sebring and 21 yearlings by Peggy Jean’s sire Myboycharlie. Widden Stud’s exciting young sire Star Witness leads the Inglis Classic by representation with 27 lots. Other proven and exciting young sires with runners on the racetrack include Magic Albert (22), Snippetson (22), Hinchinbrook (17), Artie Schiller (13), Choisir (13), Congrats (12), Duporth (12), Manhattan Rain (10), Not A Single Doubt (10) and Snitzel (10). Inglis Classic is notorious for unearthing racetrack talent from young sires. Triple Honour gave subsequent champion trainer Chris Waller his first Australian Group 1, Pressday gave Waller his first two-year-old Group 1 and the aforementioned Brazen Beau his most recent. All three Group 1 winners were bought from Inglis Classic from the first or second crop of their respective sires for between $38,000 and $70,000. The outstanding crop of First Season Sires assembled for 2015 Inglis Classic include Dream Ahead (17 lots), Smart Missile (14), Poet’s Voice (13), Uncle Mo (10), Zoffany (10), Pluck (10), Gio Ponti (6), Love Conquers All (6), Foxwedge (5), Master Of Design (5), Shrapnel (5), Toorak Toff (5), Moshe (4) and Skilled (4). Leading nursery Widden Stud have compiled a draft of 49 yearlings for 2015 Inglis Classic. Other studs with sizeable drafts include Bowness Stud (25), Emirates Park (22), Broadwater Thoroughbreds (21), Vinery Stud (21), Ambergate (18), Yarraman Park Stud (17), Amarina Farm (14), Arrowfield Stud (14), Goodwood Farm (14), Middlebrook Valley Lodge (14), Torryburn Stud (13), Davali Thoroughbreds (12), Edinglassie Stud (12), Marquee Stud (12), Rosemont Stud (12), Turangga Farm (12), Carramar Park (10), Kambula Stud (10), Riversdale (10), Sledmere Stud (10) and Supreme Thoroughbreds (10). All yearlings offered at the 2015 Inglis Classic Summer and Autumn Books are eligible for entry into the $5,000,000 Inglis Race Series covering their 2YO, 3YO and 4YO racing seasons. Previously announced enhancements to the Inglis Race Series from 2015 include a boost for the Inglis Nursery to $500,000 and the inclusion of new $250,000 3YO Sprints in both Sydney and Melbourne.